Media Rooms offers a wide variety of Lutron motorized shading options. Lutron provides hundreds of different shading solutions for one’s home theater, each motorized and powered through a remote or automated system. The shades come in a wide variety of patterns, fabrics, and colors. 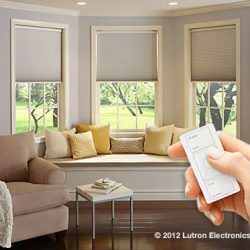 Lutron offers: roller shades, horizontal sheer blinds, pleated shades, honeycomb shades, wood/venetian blinds, drapery track systems, vertical drapery systems, and roman shades. Homeowners may set their shades to close and open at an automatic time, or utilize a remote.